Calgary—that’s in Canada, right? If Cool Runnings and something about a Jamaican bobsled team at the Winter Olympics are the first things you think of when you hear “Calgary,” you’re not alone. Admittedly, that was pretty much all I knew about it before I had the opportunity to explore Indigenous culture in the Calgary area recently. It turns out that I was overlooking an incredible destination in Canada. As I started researching before my trip, I discovered a rich, diverse, and at times, painful history of the First Nations people in Alberta. It’s the story of most Indigenous cultures around the world. I’ve long been interested in knowing more about the cultures of Indigenous peoples in North America–how they’ve survived tragic mistreatment and how they persevere in celebrating and passing on their culture. It was with this curiosity, ignorance, and earnest desire to be respectful that I traveled to Calgary to experience First Nations culture firsthand. I was hosted by Visit Calgary during my stay in Calgary, Alberta. All opinions expressed are my own. Have you ever sat listening to someone older than you, and you just want them to keep talking for hours? That’s how I felt as I sat down inside a tipi to a meal of bison, bannock bread, and fish and listened to Elder Bruce Starlight, his wife Deanna, and Chief Lee Crowchild share stories of the Tsuut’ina people in Calgary. I was humbled and honored to sit around the table and be welcomed in as a guest, and I could have stayed there all day. 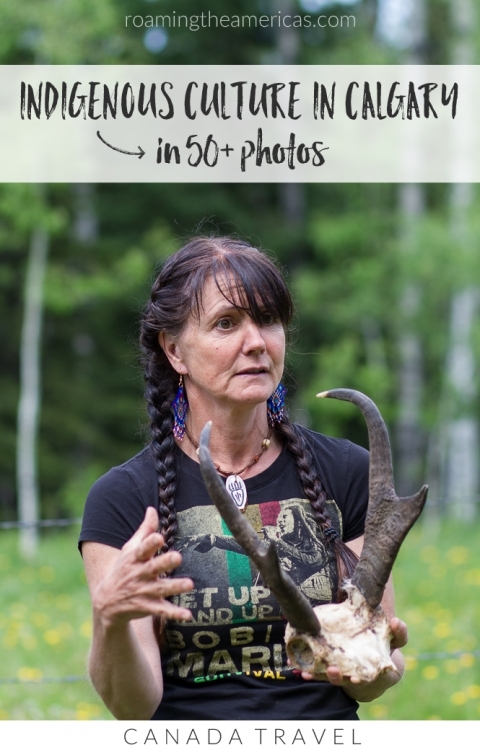 Spotted Elk Camp is a family-owned cultural center on Tsuut’ina land and was the dream of Deanna Starlight. The name comes from a combination of Bruce and Deanna’s Indian* names: Spotted Eagle (Bruce) and Elk Woman (Deanna). She and her husband run it with their children Joe, Louie, and Holly. While there are elements of their culture that are sacred and must remain within their own people, they openly and eagerly shared many things with us. We saw a tipi being pitched as we learned about what each part signifies, tasted First Nations cuisine, and watched several traditional dances. For the Starlights, running the cultural center isn’t about teaching their culture in a way that says, “This is the way.” But it’s a place where they make learning about First Nations culture accessible to anyone through interpretive programs, arts and crafts, traditional food, and dance performances. Our lunch was catered jointly by the chefs at Spotted Elk Camp and Chef Bill Alexander of the neighboring Grey Eagle Resort. Art is not the first thing I picture when I think of fish scales. I see my grandmother cleaning our freshly-caught dinner, scales flaking off into the sink. I think of hours spent out on a remote lake in northern Maine with my grandfather (I assume he did most of the actual work). I think of that wood-paneled kitchen in my grandparents’ cabin where I spent countless summer days as a kid. So when I saw a fish scale art workshop on my itinerary, I was intrigued…and definitely not picturing what it turned out to be. Moonstone Creation is a family-owned native gallery and gift shop in Calgary, run by mother-daughter team Yvonne Jobin and Amy Willier. (They’ve also got a pint-sized “PR guy,” Colton, who was hanging out playing video games while we had our workshop with his mother Amy). Amy is Cree First Nations and has learned many of the traditional art forms, like hide tanning and beadwork, from her mother. She also creates intricate and delicate fish scale art, an art form that originated in northern Canada. They sell these authentic native crafts in the gift shop and offer hands-on workshops throughout the month. Everyone had gone inside, and I ran down to the tents to quickly grab something. With no one around, I paused for a minute and sat down on the benches by the fire pit to enjoy the stillness. The absence of man-made noise was apparent as I looked up at the sky through the sparse forest. Nature was busy chattering, creaking, rustling, existing. It wasn’t quiet, but I felt its stillness surround me. Painted Warriors Ranch is exactly where you want to go to unplug. Located about an hour northwest of Calgary, Painted Warriors is a family-owned Aboriginal business. Owners Tracey Klettl and Tim Mearns offer tour packages to visitors as well as training for guides and interpreters to help expand Aboriginal tourism in Alberta. At Painted Warriors, you’ll learn about First Nations and Metis culture as you enjoy nature. Tracey’s daughters Morgan and Callie bring their knowledge of yoga, raw food preparation, and foraging as they help lead some of the tours. Learn fire making and wilderness survival skills, and put them to the test as you start a fire for dinner. Get archery lessons and then head out into the woods for some 3D target practice (which is apparently a thing, and way more fun than I anticipated). Go snowshoeing through the woods in the winter as you learn about how traditional snowshoes were made and used. And enjoy a night spent outside “comfort camping” in a trapper tent. Have you been to Calgary? Which of these places would you most like to visit? Let me know in the comments! *A note about terms: Generally, I use the terms Indigenous or First Nations, unless someone has used another term (such as Indian or native, as you will see in this post) in reference to themselves in a specific quote or paraphrased quote. Indigenous is a broader term and encompasses First Nations (you will sometimes hear Aboriginal, though some do not like this term), Inuit (of northern Canada), and Metis (mixed Indigenous and European ancestry). This post discusses these terms in more depth. As someone who cares very much about both clarity and respect through language, I am always learning and will modify these terms if needed.